Need a little extra encouragement to make that Jump Rope Dress this month? Well, look no further. Amy of Badskirt, your Australian co-host of the recent Ice Cream Social sew along, is back to co-host again. This time, she’s joining forces with the team from Sew, Mama, Sew! and a few special guests to make this a truly intercontinental event. You can find all the details on the kick off (it starts next Monday) on the Sew, Mama, Sew! blog. 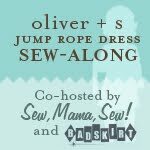 And stop by the sew along’s Flickr group for some Jump Rope Dress inspiration.